Japan Centre can provide a wide range of sushi, sashimi, sukiyaki and meat at a special discounted rate for such events. 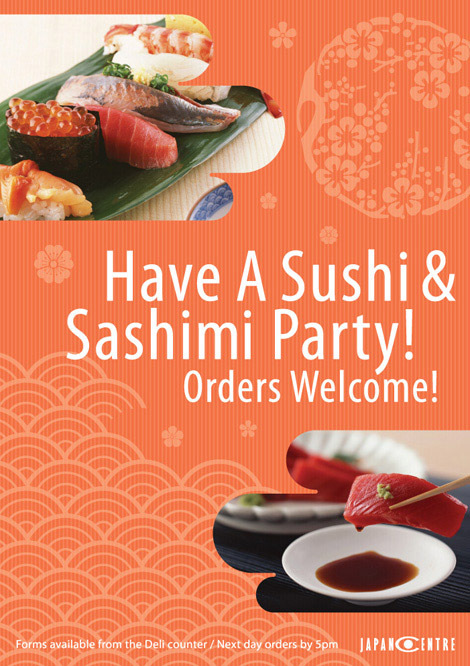 Choose from a long list of sushi, hosomaki, uramaki, hand rolls, nigiri, assorted sashimi and much more. All food is freshly prepared on the premises the same day by our superb team of chefs. What’s more, if you order by 5pm your food will be ready by the next day. Great value as well, just £1.10 for 6 pieces of cucumber hosomaki or £2.75 for spicy fresh salmon rolls! If you have any questions don’t hesitate to ask any member of staff in store. Order forms are available from the Deli counter at our London shop, 213 Piccadilly. Delivery is currently not available, pick up only. Posted in Uncategorized and tagged party, sashimi, sushi. Bookmark the permalink.